While we were renovating our new master bathroom, we decided to do the guest bathroom (our former master bathroom) at the same time. This has been mostly done since May, but we finally got around to hanging the shelves and putting the finishing touches on it. 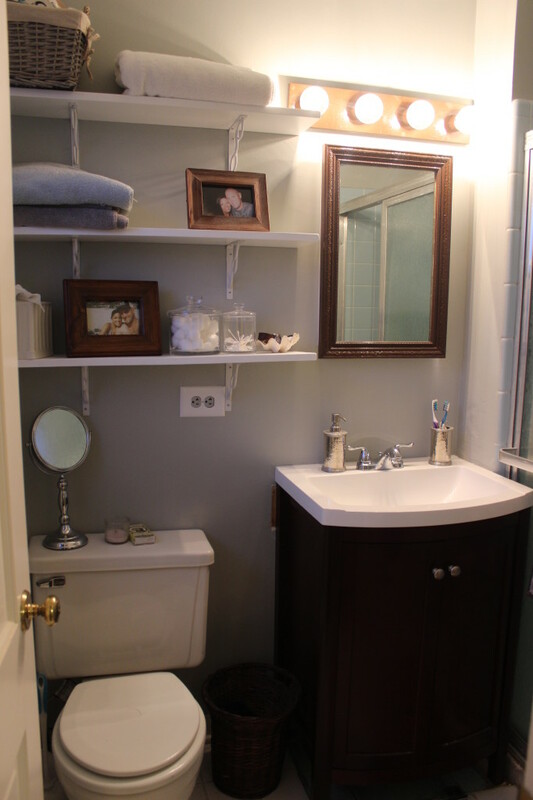 Shortly after moving in, we gave it a little facelift with paint, a new vanity and some shelves. The shower stopped working though, so it wasn’t even functional. 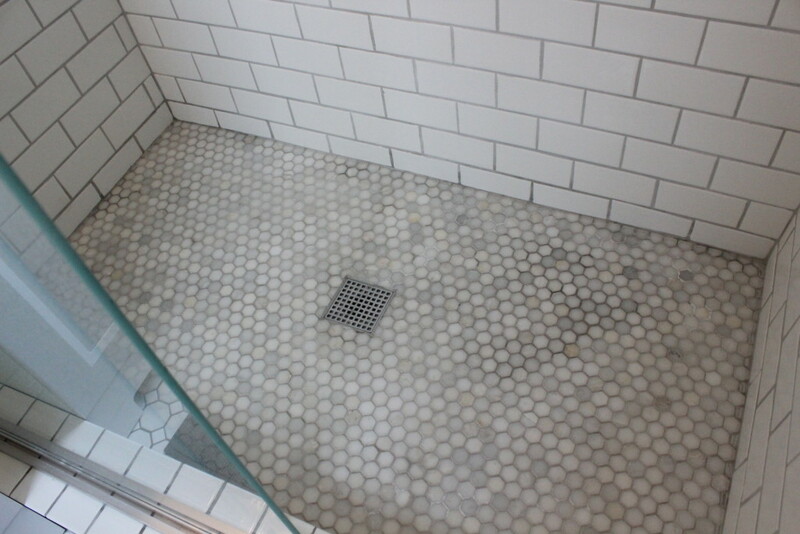 We did white subway tiles in the shower, and marble hex tile in the niche and on the shower floor. 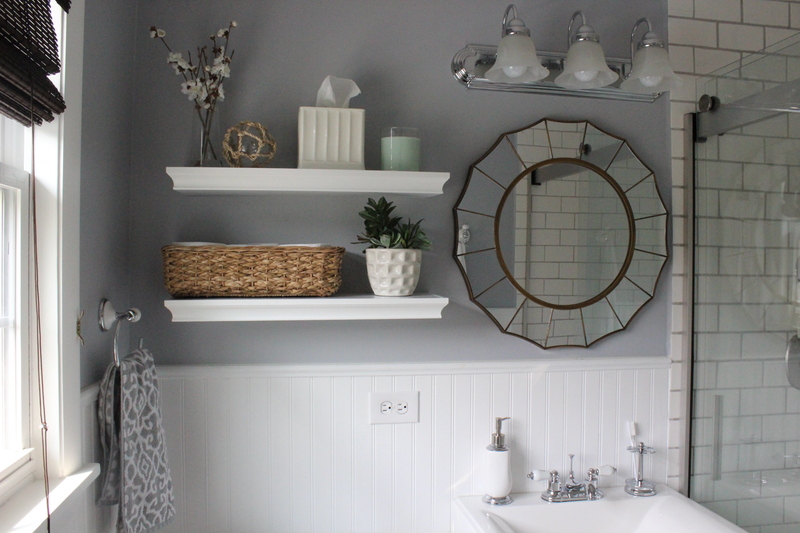 We installed beadboard wainscoting across the lower half of the wall and painted the rest of the walls Lazy Gray by Sherwin Williams. The vanity is from Home Depot, lighting from Lighting Direct, and the Starburst mirror, shelves and most accessories are from Target. The floor tile is a vintage-looking white octagon tile with dark gray grout. Here’s the other side of the room. The chrome towel hook is from Home Depot which matches the faucet, hand towel holder and toilet paper holder. The shower doors were off the shelf from Home Depot. That concludes the tour. 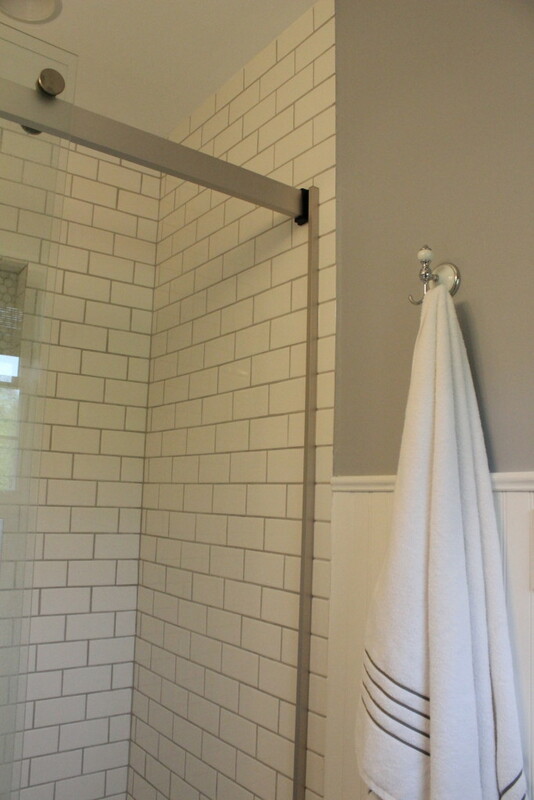 We hope our guests enjoy having their own “en suite” bathroom! 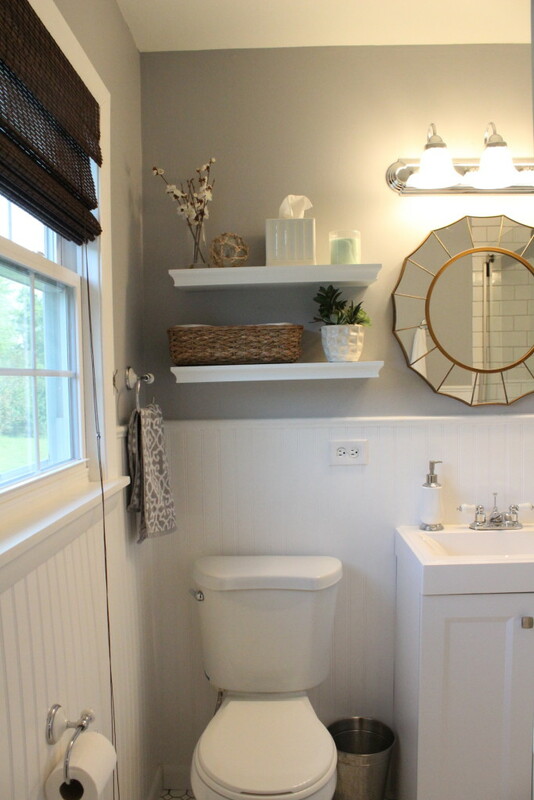 Coming up I’ll be sharing our new master bathroom/bedroom/closet and the finished rental property. Great job. 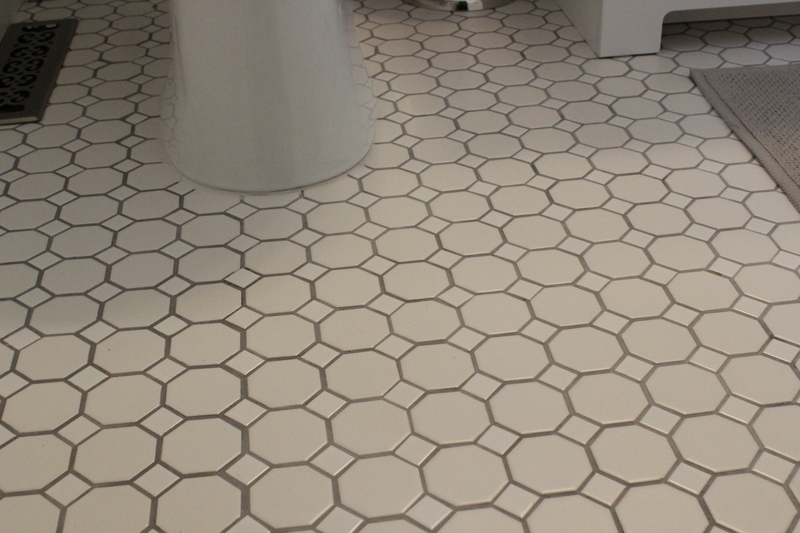 Absolutely love the floor tile and of course the subway tile with the grey grout. 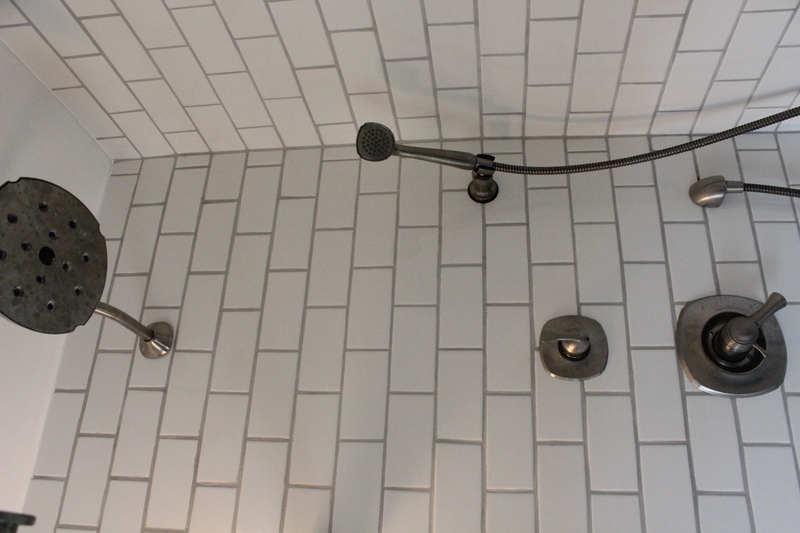 Also, I love the fact that the bath/shower fixtures have a matte appearance. Where did you find them? Thanks! We got them from Faucet Direct. 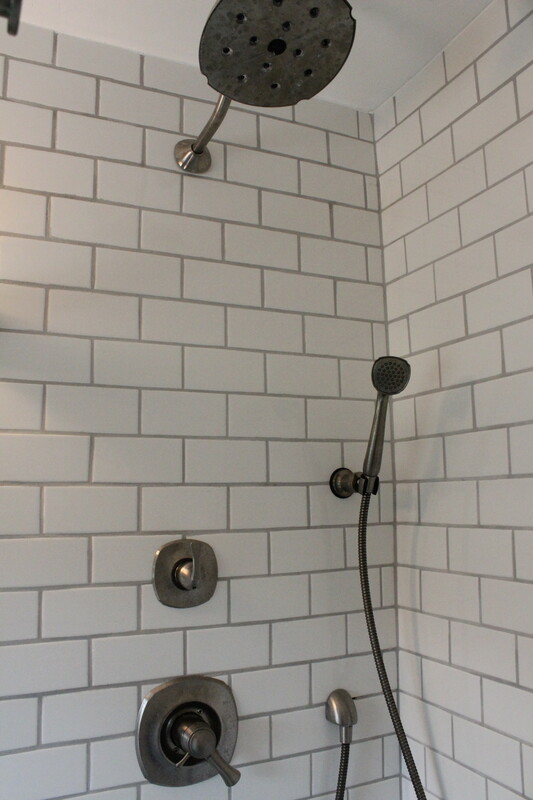 Here’s a link: http://www.faucetdirect.com/delta-dss-addison-1703-monitor-17-series-dual-function-pressure-balanced-shower-system-with-integrated-volume-control-shower-head-2-body-sprays-and-hand-shower-includes-rough-in-valves/p2414767. It is the Brilliance Stainless finish. What color and brand is your subway tile? It all turned out beautiful! Thanks it is just standard white subway tile from Lowes I think. 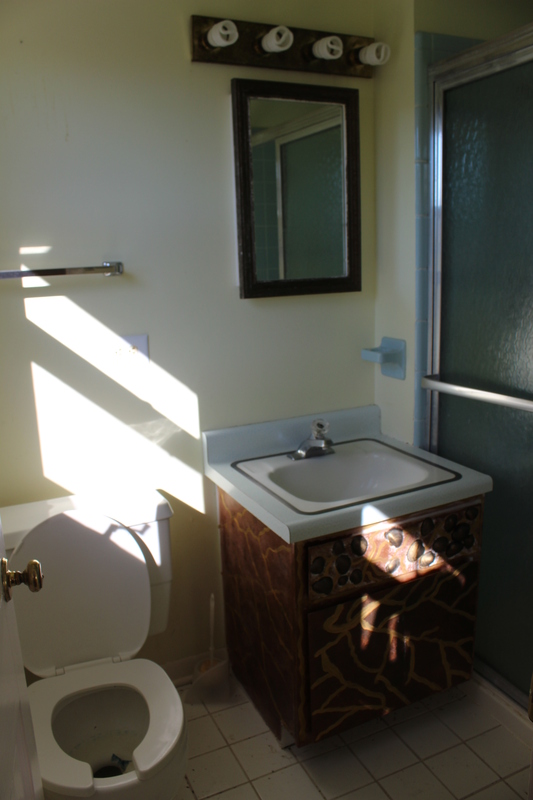 Your bathroom is beautiful! 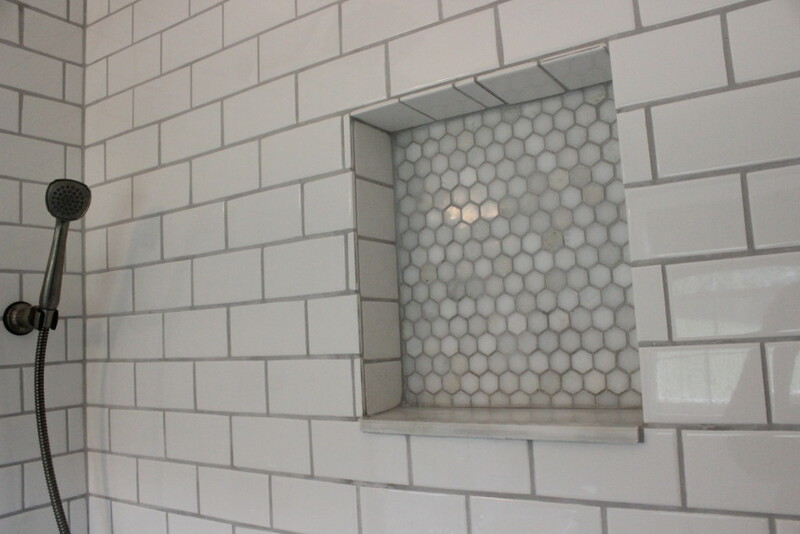 We are trying to decide on a grout for our kitchen, do you know what grout you used?